This page is created to assist in the righteous struggle to make sure that the fallen World Trade Center towers are replaced by structures not one inch shorter...if we can not show the resolve to do this,those who died with the Towers have been disgraced. New York's officialdom thus far has been determined to enforce guidelines ensuring that only bad plans are even considered; no other policy could have given us the infamous "Libescheme",which finished last in their own official public poll.We continue the fight for the first-place finisher,"Neither" (of the two plans bad enough to become official finalists). 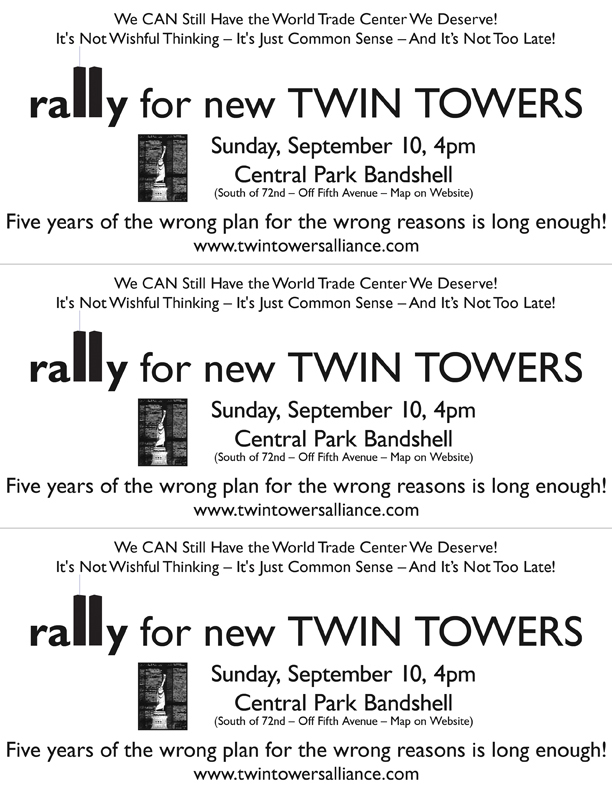 On September 11th 2011 the book DEBACLE was released, compiling essays by pro-rebuilding advocates including WTCRM members and edited by member Joe Wright. This image link was a promotional flyer. We can never rest,or assume the build-small advocates will rest, until the tall buildings are completed.We are in the right,and to us it falls to fight.